The most underrated yet one of the most powerful aspect of software customizations in smartphones is probably the wallpaper. A huge number of users do not even change the default wallpaper, which came with the smartphone. However, wallpapers can play a great role to change your mood or help your smartphone give a nice and cool vibe. There are some great sources for finding a great wallpaper. There are some wallpaper apps for both Android and iOS that can help change the inner look of your smartphone. 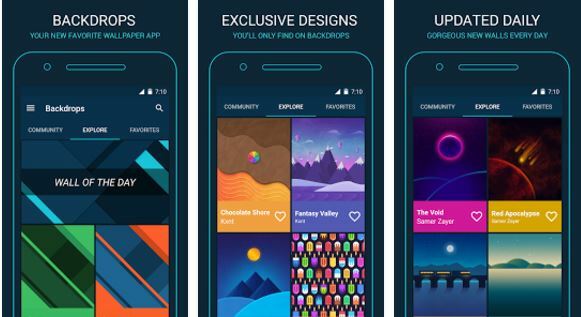 We will talk about 5 of the best Wallpaper apps for Android. It is one of the most ‘awesome’ apps you can find for wallpapers. It has a rich collection of wallpapers and a lot of them are exclusives. It has a unique feature called wallpaper of the day, which can let you find some dope wallpapers every day. The app isn’t completely free and the premium version let you access a huge collection. However, the free version is not bad. It still lets you access a huge amount of wallpapers for your phone. It is an app for live wallpapers that can give your home screen a nice look. It can automatically cycle between different wallpapers based on what you like. You can also connect to other apps like Backdrops so it can source its wallpapers from there. Tapet is an app, which uses a different algorithm and generate abstract wallpapers. It can change wallpaper automatically every day. One can easily select different patterns and colors based on which the app will generate the wallpapers. It is a completely free app with an interactive interface. The app has a huge collection of wallpapers and the users upload most of them. You might not like all but due to its rich collection, if you try to find some suitable for you, you can find them. The wallpapers are classified based on various categories. The user can search for what they want. One of the coolest feature of this app is that it also has a collection of live wallpapers and ringtones. It can act as an all in one app if the user likes to change the sound and wallpapers of the phone quite often. Not all the wallpapers for smartphones are third party apps. The mother of Android, Google has an app of its own too. The app is quite impressive. It has a unique collection of landscapes, cityscapes, concepts and they can be set to change every day automatically. The app is free and the collection of it is worth trying.